Sheen Kong Industrial Co., Ltd.
For gases, pressurized gases (oxygen, air ect.) and low viscosity liquids up to 60 degrees celcius, with liquid filling for measurement points subject to vibrations and high dynamic pressure loads, no formation of condensation. 3. 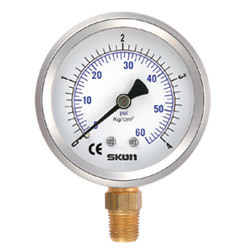 Pressure range: 0/1 to 0/500 kg/cm² (bar). 4. Operating temperature: working temperature: -max 60℃, Ambient: -25℃ ～60℃. 5. Connection: Brass Alloy, lm/lmb/cbm 40mm thread 12mm 1/8’’ , PT, NPT, PF, BSP 50mm thread: 14mm 1/4’’, pt/, npt,pf, bsp. 6. Sensing element: bourdon tube, brass alloy, ＜ 70kg/cm² (bar) coil, ≧ 70kg/cm² (bar) helicoil. 8. Dial: aluminium in white with lettering in black. 9. Pointer: aluminium in black. 11. Upper ring: aisi 304. 13. Window: laminated safety glass or acrylic. 14. Order options (1) Filling fluid optional. (2) Flange option. (3) Red mark pointer. (4) Clamp fixations.